The next chapter in my summer freezer cooking is Whole-Wheat Chocolate Pancakes. I actually prepared and froze these sweet pancakes about a week ago, but I am just getting it into a post for you all now. Money Saving Mom provided the recipe and inspiration for these pancakes, and they have been a hit with the boys. 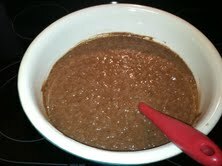 Finally, when I prepared the batter, I made enough for freezing and for that night's supper. We frequently do breakfast for lunch or supper, because it's our favorite meal. The boys and I experimented with various toppings: traditional syrup, strawberry freezer jam, fruit salsa, coconut, and fresh strawberries. 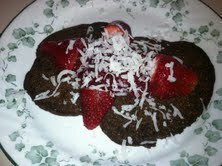 I loved mine topped with fruit salsa, coconut, and strawberries. After much deliberation, we decided they are all delicious, but the boys have continued to request strawberry freezer jam on the mornings we have heated up the frozen pancakes for breakfast, so I guess that is the winner.